Welcome to the August edition of the Inclusive Growth Bulletin! In this issue, we’re glad to share a collection of new publications released by the International Policy Centre for Inclusive Growth (IPC-IG), ranging from a study on behavioural economics and poverty reduction policies, to an overview of Brazil’s fiscal policy from 2005 to 2015 and beyond, to an interesting paper about the social dimensions of Saudi Vision 2030. We also bring the latest news and updates regarding the IPC-IG's activities. 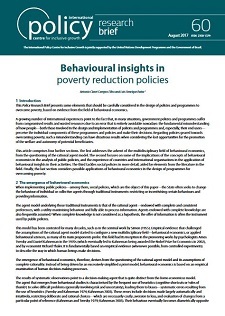 In the Policy Research Brief Behavioural insights in poverty reduction policies, authors Antonio Claret Campos Filho and Luis Henrique Paiva (Institute for Applied Economic Research—Ipea, and IPC-IG) present elements that should be carefully considered in the design of policies and programmes to overcome poverty, based on evidence from the field of behavioural economics. Some of these elements include the questioning of the rational agent model, the implications of the concepts of behavioural economics in the analysis of public policies, and the experience of countries and international organisations in the application of behavioural insights in their activities. This publication is available in English, and Portuguese. In the Working Paper Brazilian fiscal policy in perspective: from expansion to austerity, Rodrigo Orair (Ipea and IPC-IG) and Sergio Wulff Gobetti (Ipea) analyse the changes in orientation and composition of Brazil’s fiscal policy, focusing on three recent periods: 2005–2010; 2011–2014; and from 2015 onwards, exploring their relationship with economic performance. The study is available in English, and an accompanying One Pager is available in English, French, Portuguese and Spanish. Amina Saeed Elsayyad (Al-Azhar University, Egypt), and Abdel-Hameed Nawar (Cairo University, Egypt), in their One Pager The social dimensions of Saudi Vision 2030: a paradigm shift, explain that to address internal development issues in Saudi Arabia such as poverty, vulnerability and inequality, the Vision 2030 plan and its programmes have, inter alia , pointed to a number of specific goals, targets and policy measures to reduce social vulnerability, address labour market issues for women and promote quality in education and training initiatives. This publication is available in Arabic, and English. The One Pager Mainstreaming graduation into Social Protection floors, by Harshani Dharmadasa, Ian Orton, and Lauren Whitehead (BRAC USA), is now available in French. The study was previously released in English. The One Pager Adapting Fomento to countries in Sub-Saharan Africa, by Kate Ambler, and Alan de Brauw (International Food Policy Research Institute—IFPRI), and Susan Godlonton (Williams College), is also now available in French. It was previously released in English. Our colleagues and partners at socialprotection.org will host the webinar (in Spanish): ‘Investing in the early years: the experience of Chile and Peru', on 24 August. Organised by the Brazil Learning Initiative for a World Without Poverty (WWP), this webinar will present key features of the implementation of Early Childhood Development (ECD)programmes, sharing the experiences from Chile Crece Contigo programme and the Peruvian Cuna Más. To register for this free event, please click here. The IPC-IG hosts the socialprotection.org online platform, and is one of the partners of the WWP.